The pain and tension in the shoulders and neck are highly uncomfortable. They do not necessarily stem from the same region as the pain, as neck pain might be caused by a shoulder impingement, and pain in the shoulder can be a result of some tension in the neck. However, the entire back side of the body is interconnected via the superficial back line, which stretches from the forehead, down the spine and the back of the legs, to the bottom of your feet. This means that a dysfunction anywhere in this line can cause pain in the certain area. 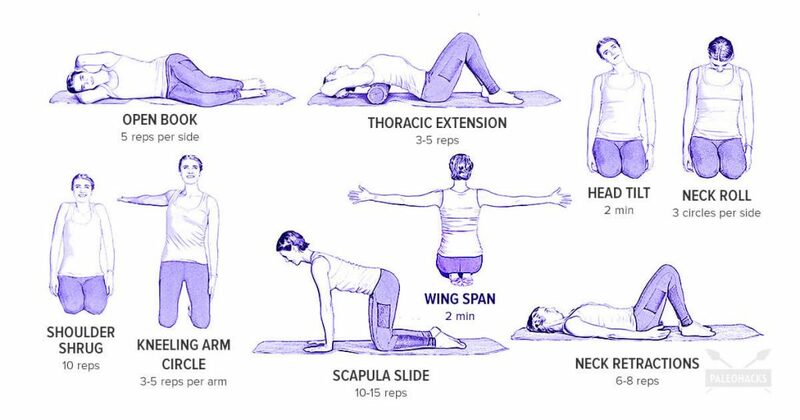 Sitting on the floor, with the mid back resting on a foam roller or a rolled-up bath towel, and the head supported in the hands, breathe out and stretch the spine back over the roller. Inhale to hold, exhale, and return to the initial position. While lying with the knees bent in front, and the hands over the ears and the elbows pointing forward, breathe in and try to reach the top elbow to the ceiling. Breathe out and open the top elbow to the back side to touch the ground. Hold for a few seconds, relax the shoulders, breathe in, breathe out, and return to the initial position. Start on all fours, with the wrists under the shoulders and knees under hips, press firmly into the palms and fingertips, while the elbows are straight. Breathe in, slide the shoulder blades (scapula) together, breathe out, press into the hands, and go back to the starting position. Sit down or kneel, and keep the head stacked directly above the shoulders and the arms by the sides. Breathe in, breathe out, and lower the left ear towards the left shoulder. Hold, and repeat on the other side. Next, breathe out and turn the head to look over the right shoulder, breathe in again, and return to center. Exhale, and look over the left shoulder. Start in the same position, inhale, and elevate the shoulders up towards the ears. Breathe out, and return them down, feeling the blades settle on the back. Lying on the back, with the knees bent, and the arms down by the side, breathe in, and jut the chin forward to the ceiling, while the back of the head remains on the floor. Then, breathe out, and retract the chin in towards the throat. Sit down or kneel, inhale, exhale and gently lower the left ear towards the left shoulder. Bring the chin towards the chest, breathe in, and bring the right ear towards the right shoulder. Reverse the circle. From the same initial position, face the palms in and the thumb forward. Breathe in, reach the left arm straight up to the ceiling, and hold. Exhale, rotate the palm away from your body and circle the arm until it is back down by the hip, palm facing out and baby finger forward. Inhale and reverse the circle, pause, and return to the initial position. Start seated on a chair, with the head stacked directly above the shoulders and the arms stretched directly out to the side, in line with the shoulders. Inhale, and reach the arm up overhead, palm forward. The left arm should be down by your hip, bend the elbows and reach the fingers towards each other at the center of the back. Hold, and return to the starting position. Furthermore, massage has been proven to be an effective remedy in the case of neck and shoulder pain. “Stronger massage stimulates blood circulation to improve the supply of oxygen and nutrients to body tissues and helps your lymphatic system to flush away waste products. It eases tense and knotted muscles and stiff joints, improving mobility, and flexibility. “[A] … study from Thailand suggests that traditional Thai massage can decrease pain intensity, muscle tension, and anxiety among people with shoulder pain. Meanwhile, research from the Touch Research Institute at the University of Miami in Florida found that when adults with hand pain had four weeks of massage therapy, they reported a lot less pain, anxiety, and depression.